Stepping into Playback almost feels like the beginning of a Black Mirror episode; the silence is palpable in the dimly-lit space, as people sit before screens, each person plugged into the monitors, staring intently ahead. The calm and quiet is a welcome distraction from the packed lower floor of mac, where people are continuously swarming around the open space; weirdly enough, even though the double doors to Playback are open, it feels like a safe haven, isolated from the rest of the arts centre. The set-up is functional, yet quite captivating; minimalist structures are set up throughout the room that encase a screen to select films, a monitor to watch and a couple of pairs of headphones below. This could be quite a passive experience, one where you stumble in, take a quick look and exit to explore the rest of the gallery, yet each person who enters is memorised and instantly takes a seat in one of the stalls to begin. A real highlight of the exhibition is the complete flexibility it offers. The interface is so simplistic you can easy browse comedy, drama, music, dance, drama or animation with the touch of a button. The idea that Playback brings the films to the audience, as opposed to the other way round, is an interesting format and is a smart way of getting the endevours of budding creatives out there. Much of the work being displayed covers scenarios so far removed from the viewer that you’re able to gain a sobering, eye-opening insight. For example, Courtney Grigg’s 18, a POV documentary that explores Courtney’s journey through homelessness when she was eighteen. Or Rediat Abayneh’s 25 Days of My Life, which is dedicated to those ‘who lost their lives in search of better’ and charts her brief stay in the infamous refugee camp ‘The Jungle’ prior to her journey to England from Calais. These pieces draw you in immediately by conveying such emotion in a short time frame. I felt myself unintentionally breathing a small sigh of relief and gratitude when I read in the description below that despite the circumstances depicted in their work, they are now studying towards their chosen career, or are exploring another walk of life and have made it out of sombre situations. I can say with complete honesty, there was not one single short I viewed that I didn’t appreciate in some way. Each work was enlightening and completely unique. In mainstream film I often feel like what I’m watching is just regurgitated with a different cast, location or a slight differentiation of a basic scenario. 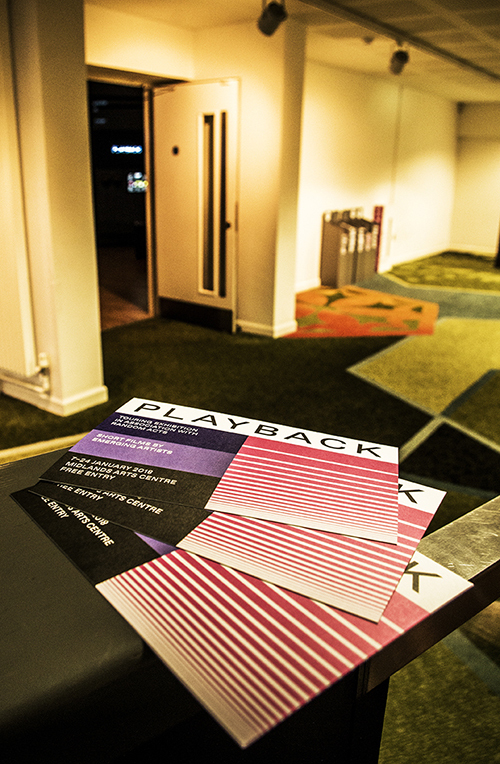 The sheer individuality of each piece presented at Playback took me by surprise; alongside thought-pieces and documentaries charting real life experiences, the exhibition was brimming with off-the-wall, abstract and bizarre concepts, which was so refreshing and showed the passion of hungry young filmmakers. I felt this was especially reflected in Battle by Darnell Smart, which relied on mostly a non-verbal performance, mixed with sound effects to create distortion of the main character Deshawn. The minimalist setting and almost sterile visual at the end combined for a really effecting piece. Additionally, Bliss by Billy Floyd stuck in my memory long afterwards. No dialogue was needed, as the piece was carried by minimal sound effects and intense, non-verbal performances that used the same setting for each shot, just varying the content. Battle and Bliss left me genuinely excited for the work that future filmmakers will produce as the execution of these ideas was something I hadn’t witnessed before and really, this is what Playback is all about. It would be near impossible to comment on all the content, with over 145 short films, ranging from 90 seconds to three minutes a piece, on show. 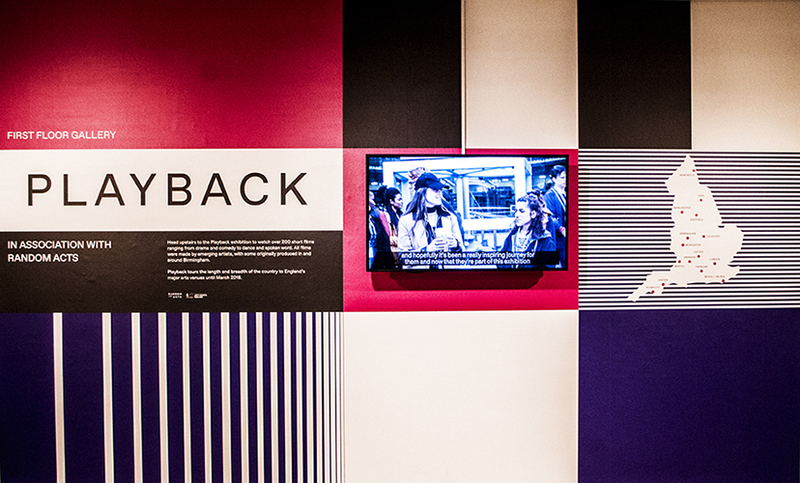 If you do have the opportunity, give yourself a full day and head down to mac and see, or rather experience, for yourself – Playback is free to enter and in the arts centre’s First Floor Gallery until Wednesday 24 January 2018. I’m sure each individual will discover something different from the next and connect with the pieces in a completely unique way. Personally, I tend to gravitate towards drama, but the flexibility of Playback exposed me to a world of other possibilities; content that I would never have previously considered due to admittedly, my own ignorance or dismissal of genres that don’t seem instantly appealing. I felt a particular highlight was the animation section and I’m so glad I allowed myself to be led by the exhibition, as there were some excellent pieces in there. Specifically, My Familiar by Leah Morris, an animation that blends live action scenes with animation to explore ‘the comforts of non-verbal communication’ in the face of isolation and loneliness. The piece is set against a minimalist, yet effecting score, and uses no verbal narrative within its series of vignettes, which works to astounding effect. So much so that halfway through I looked down to find myself with little marks imprinted into my palm where I’d be gripping the chord of the headphones, completely engrossed. Or Meet Cute, another short that splices live action with animation and blurs the line of creation, production, fiction and reality – a fun and interesting piece by Chris Consentino. Adrift was also a highlight, a short sci-fi that ‘blends lo-fi animation, indie folk and quirky live action’ by Will Crerar, an aspiring screenwriter and director from Newcastle. The drama explores decision making through the protagonist, a teenage boy trapped in space, who is at the crossroads of change but hesitant to move forward. The setting and minimal, spoken-narrative deliver a point that is reflective of wider society in an extremely clever way. After two hours of selecting films I was completely captivated by the exhibition’s documentaries and dramas and found the comedy section to be a welcome break, one that pulled me outside my head for a while. Some highlights were Contactless that deals with a scenario not as far removed from the future as it should be, set against the backdrop of Birmingham with a whacky, upbeat soundtrack that allows the comedic overtone to shine through but also elevates the distress and seriousness of the political message. The variation in styles was a joy to experience throughout all the genres, but in particular, in shorts such as Chops which is a beautifully stylised laugh-out-loud piece by Jac Clinch, and Slice by Hari Ramakrishnan, a dark satire exploring the graduate experience with great visuals and perfectly delivered narrative by Marie Hamilton, paired with an eerily perfect performance by Dorothy Collins. The final highlight was All That Is by Camille Summers Valli and Wessie Du Toit, a beautifully shot drama-documentary that intimately explores ‘love and its role in the lives of five individuals’, through snapshots in a stunning sepia quality. As the short eloquently states “any experience is good, to talk about it is better” – which I feel encompasses the whole event perfectly. There were 145 narratives for the audience to explore in Playback and each has taken a personal experience, feeling, emotion or thought and turned it into a work of art. Most of the work can be found through the Random Acts website, but actually attending the exhibition adds so much more to the experience, as you’re able to fully submerge yourself amongst the work in the peaceful atmosphere that the mac has created. Events such as Playback are vital in the medium of film, creating exposure for young creative, as well as giving them a platform and voice to address current issues and situations. We just need to be ready to listen.